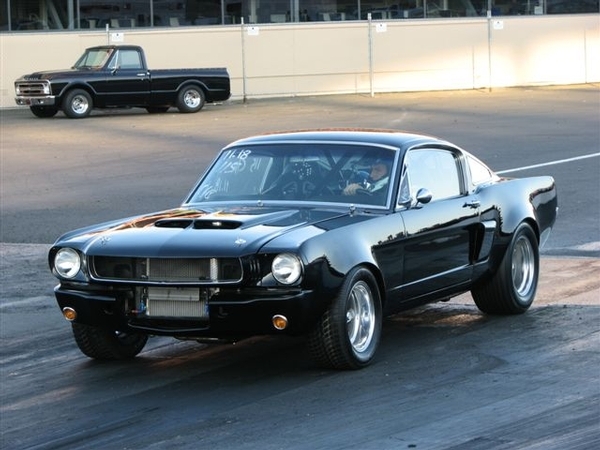 This bad to the bone, twin supercharged / twin nitrous system 65 Fastback was my personal car. It has a killer 347 stroker with all forged internals, including a light weight forged crank, H-beam rods, JE pistons, race ported Victor Jr. heads, a .630” roller cam and a few other goodies that are completely one of a kind. Aside from the PAIR of 55 mm cog driven Paxton NOVI 1200 supercharges, it has dual nitrous systems. One acts as an intercooler, and the other is a fuel / nitrous delivery system. It also has a one of a kind intake manifold that we fabricated out of what was once an Edelbrock RPM “air gap” manifold that we machined the entire insides out of and TIG welded a custom made dual carb mount for the pair of one of a kind carbs on top. The carbs I designed myself and had my friends at Quick Fuel Technology build them. Basically with a small block Ford like this, you are really limited on space, so 2 in-line double pumpers were simply out of the question, and mounting a pair sideways would create more headaches with linkages and such than I wanted to mess with, so I came up with the idea of making a pair of shorty double pumpers out of vacuum secondary carbs by using 4160 series front bowls all the way around and getting rid of the transfer tubes. I also wanted annular discharge boosters and metering blocks on both the front and the rear, which most vacuum secondary carbs just don’t have. By doing this, it allowed us the space to mount them both in-line for the pair of bonnets. It runs absolutely awesome! We ran it on a chassis dyno just to check the air / fuel ratio and it made 614 HP at the rear wheels on pump gas without the nitrous system in use! That is about 760 or so HP at the flywheel. A little extra tuning and we picked up an additional 66 HP. We never ran it on the chassis dyno with the nitrous system.There was no need to. Firstly, with the standard street tires we had on it, it was already hazing them on the rollers no matter how tight we locked the car down, it kept spinning the tires on the rollers due to the ridiculously quick engine response. It would go from about 3,000 RPM to 8,000 instantly, plus it's already completely out of control when you drive it, so there's no way to really use for the nitrous when you already can’t keep it straight or pointed in the direction you would like to be going, so it never got used. Now, some guys will be saying; "Well my buddy has a supercharged 2012 Mustang that makes 800 RWHP". Yeah, that's fine and dandy on an overhead cam, 4 valve per cylinder, computer designed & controlled engine, but we're doing all of this with an early 60's design push rod engine with no computer, no timing controls, no special tuning on the fly, 2 valves, etc. It's with carbs, pump gas and raw, brute force and only about 12 psi of boost. Most of these seriously monster late model, highly tuned, overhead cammed EFI cars are running 15 to 20 psi, (or more) of boost, so there's a bit of difference between the two. We're old school. If you want to see this car make a low 11 second pass (with the driver letting off the gas between shifts) then watch the video clip below. You'll see our 69 Camaro make a few 9 second passes when we were qualifying for our NHRA license. You're not allowed to go quicker than 9.90 when qualifying, even though the car runs mid 8's in the quarter mile, and then you'll see this Mustang peel off an EASY 11.30 in full street trim, on pump gas and crappy tires with a driver who for some reason thought he should be letting off the gas between shifts, LOL. This car has gone into the upper 10's @ 125 MPH in the same full street trim and crappy Cooper street tires. It is VERY hard to hook this thing up when it is only running plain street tires! Watch it launch, you'll get the idea. It has to launch real soft and slow or it'll just shred the tires and not go anywhere. Cars running 3 seconds slower launch harder than this thing does because it is set-up for road racing, not drag racing, (there is zero weight transfer and suspension travel when it launches), and if you listen close, you can hear the driver we had in it that day actually letting off on the gas between shifts. It sounds like a 4 speed car but it's an automatic. Not bad for a car that drives on the street like any other car does. That ain't no crate motor in that baby! Here is the Mustang at Infineon Raceway around 2009. At this point it had been running verry low 11's in full street trim, on pump gas at about 120 MPH with no nitrous. It REALLY has troubles hooking up so it has to be launched like a little old lady driving to church. Watch the video above and you'll see the car make one of the runs. It finally made it to the 10's at 124 MPH on a later date.